Michael Sink of Woodology is a neighbor who takes pride in his work. Many of his hand crafted wood working projects consist of reclaimed wood and scrap material. 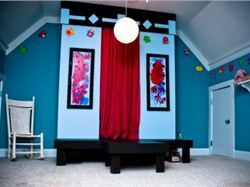 Customized projects include play houses and stages for a childs' playroom, restoring wooden furniture and custom bookshelves, bars, and countertops. Michael has done several projects in Grant Park, including the new bench and counter installed at the Grant Park Coffeehouse. Michael is also currently volunteering his time to make the Grant Park Sunburst for GPNA which has become the official symbol of the neighborhood that neighbors proudly hang on their homes! We're so grateful to Michael for his time which in turn helps GPNA give back to the neighborhood in the from of grant requests, scholarships and neighborhood beautification projects. 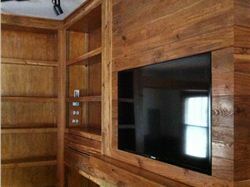 "Like" the Woodology, LLC Facebook page to see pictures posted of new projects as they are in progress and completed. 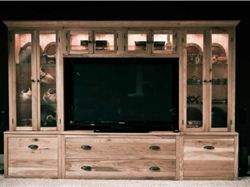 Resurfaced bookcase TV enclosure and new mantel. Made entirely from reclaimed heart-pine that were floor boards in a Kentucky Bourbon factory. They were pretty gnarly when we got them and painted over but it was worth the labor. 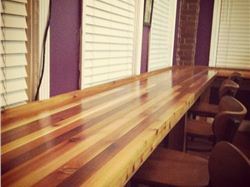 New custom butcher block counter top installed at the Grant Park Coffee house. 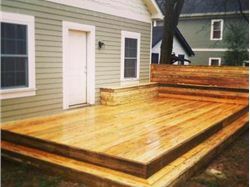 Wood deck with built in benches. Custom designed play stage for kids playroom. 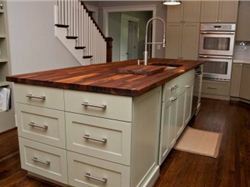 This one of a kind counter top was hand crafted from solid walnut hardwood . An oil finish enhances the natural textures and color variations of the wood . 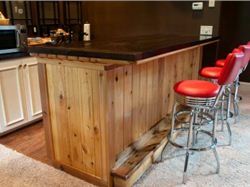 This rustic bar is made from cedar and cypress materials. A two toned finish was chosen for contrast. 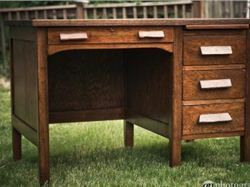 This desk was rescued from a trip to the scrap pile being pulled from a closed down school. A desk repurposed it has simple but striking features made entirely of red oak .The top was completely remade to match the body of this beautiful piece. A real find. This custom built entertainment cabinet was crafted with solid white oak hardwood featuring textured seeded glass on the upper cabinets with glass shelving and interior dimable halogen lighting. The lower cabinets feature a soft closing drawer system. This entire unit can be dismantled into six pieces if necessary. The two outside glass cabinets can be joined to make a completely new display piece.